You ever do that thing where you close your eyes and all of a sudden all you can envision are the most frightening things you can possibly think of? So I’m in the shower getting all lathered up. Then I put the shampoo in my hair and run my head under the water. Just then all I could think of are spiders (I’m extremely arachnophobic.). But with a face full of soap I couldn’t open them again because then I’d have eyefuls of pain. Man, that was a scary five seconds. 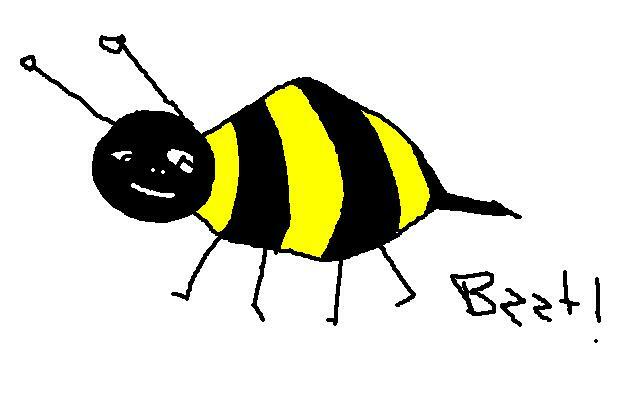 The following is my sister doing her absolute best to draw me a bee in a poorly drawn fashion. She actually has some legit talent, and you can check out her sewing projects over at http://envisionedstitches.wordpress.com/. This entry was posted in Bees! and tagged Art, bees, blog, blogging, drawing, morning, music, musings, scary, sewing, shower, vision, writing. Bookmark the permalink. That M4SONIC is awesome! Nice post. Thanks! Although I know I’d never use it I still might wind up getting one down the road. Your Welcome! Well if music is one of your passions and you have a keen interests in the M4SONIC, you’ll become one with it.